An occasional enemy boss of the Castlevania series since Castlevania II: Simon’s Quest, Carmilla is a female vampire and the last general for Dracula to survive against Simon Belmont before he could burn his nemesis’ remains. When Dracula again rises from the grave 100 years after his destruction by Simon, Carmilla joins him to face the latest Belmont in Richter. 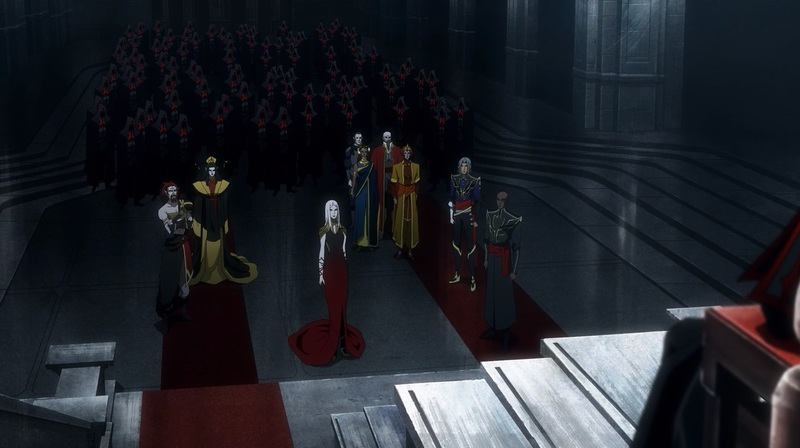 For the animated series, Carmilla is depicted at the forefront of Dracula’s nine generals. Further, it appears she will play a significant part in the origin of Hector. 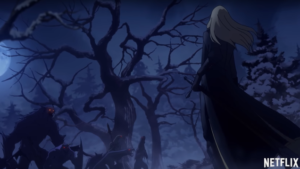 While not shown in the trailer specifically, Death is a staple of the Castlevania series. What would seem to indicate his appearance in the coming season is the depiction of his chief minions. Since their appearance in Super Castlevania IV, Slogra and Gaibon have appeared in seven additional games generally as subordinates of Death. 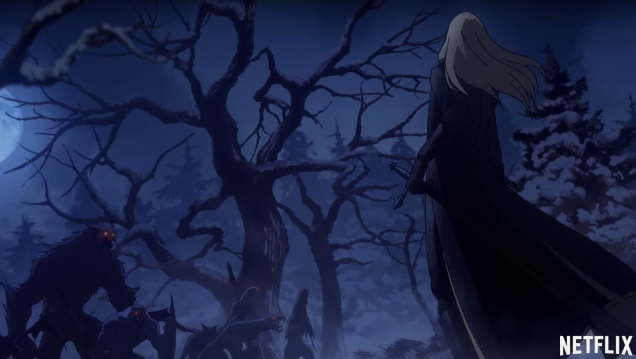 For the trailer, they are shown battling the trio of Trevor, Alucard, and Sypha in the snow covered woods just outside of a town. A human who sought out Dracula for power, Hector became a Devil Forgemaster in the count’s employ and developed a rival in fellow human and Devil Forgemaster Isaac. 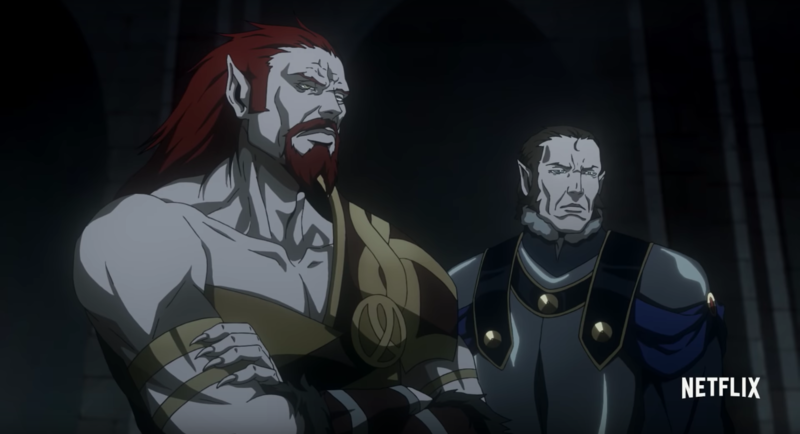 In time, both humans became generals in their master’s forces but when Dracula sent them to destroy Wallachia, Hector had no desire to do so and pleaded so that he would not have to take the lives of his species. Dracula refused and so Hector slaughtered his kind for months before the general could find a means to escape. 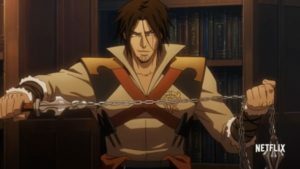 This opportunity came when he was selected to eliminate Trevor Belmont but instead deserted as Isaac was dispatched to bring him back. As Hector and Isaac fought, Belmont lead a successful campaign to subdue Dracula while Hector left a fallen Isaac to die who blamed his rival for the defeat of their master. Isaac, who survived, spent three years plotting his revenge by luring Hector to Dracula’s castle in the hope of making him a host for Dracula. Instead, Hector slew his rival who became Dracula’s host only to fall to Hector again. In the trailer, Hector is depicted in conflict with Carmilla and among Dracula’s generals with Isaac. The fourth and final member of the team that destroyed Dracula in 1476, Grant Danasty was a thief that joined a band of Wallachians to attack Dracula’s forces. When this failed, Danasty was turned into a demon and left to guard the clock tower. Upon his defeat at the hands of Trevor Belmont, Danasty reverted to his human form where he joined the fight against Dracula. For the animated series, a skeleton is shown being turned into a demon that maybe Danasty being transformed. Further, he is shown among Dracula’s generals but gone is his trademark red bandanna in favor of long red hair. 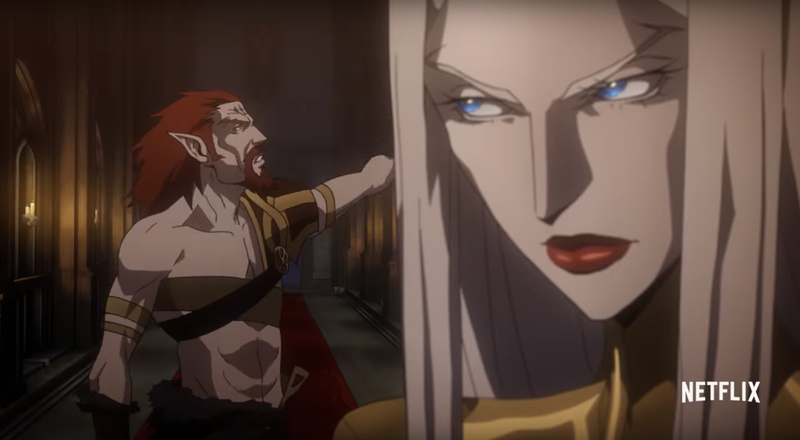 This entry was posted in Uncategorized and tagged Castlevania, Jerry Whitworth, netflix. Bookmark the permalink.